ISN'T THAT WHAT A NURSE OR MIDWIFE DOES? The most important thing a woman needs during labour is continuous support from start to finish. A doula stays with you from early labour (before the midwife arrives or you are admitted to the hospital) until a few hours after the baby is born. Your nurse has many duties such as taking care for you and your baby, documenting your labour and updating your chart and your doctor, taking care of other patients, answering the phones and other responsibilities. The nurse’s support ends when her shift does. Similarly, your midwife will join you once active labour is established. Her role is to play the nurse, doctor and doula; it is a heavy task load. She will be caring for you and the baby, updating your secondary midwife, rearranging her day, and documenting the labour. Her shift will end once you and baby are settled and her charting is finished. The doula only has one obligation the whole time she is with you—and that is YOU! We start when you start and end once the family is settled. Are you under 19 years old? We have a teen package for $50 - $200. Please contact Michelle for more details. This is an add on or stand-alone service. Studies have shown moms who receive reflexology during pregnancy have better pregnancies and shorter labours. The pregnant parent receives monthly reflexology sessions from week 5 – 35, then weekly sessions from 36 weeks until the birth. Click here to learn more about the benefits of reflexology. When a reflexology session is done within the first two weeks postpartum it helps mamas rebalance their hormones, improves circulation, and recovery, increases energy and improves sleep. Reflexology is wonderful for babies as well. The "recovery bliss" session can be strictly for mom, or done with mom and baby. Click here to learn more about the benefits of reflexology for the whole family. The earlier you interview doulas the more selection you will have of who is available. Your relationship with your doula is very personal. You both will be sharing a very vulnerable, emotional and extremely memorable time in your lives with this person. By hiring her early on in pregnancy you will benefit of having someone to turn to at 1:00 am when the feeling you noticed, but ignored because you were busy, is now freaking you out because when you got up to pee you started thinking about it so you quickly popped onto Google and are now completely stressed out. It is not something you feel warrants a call to your doctor, midwife or the hospital but now you can't sleep because you are worried. The peace of mind of having a knowledgeable, and reassuring ear in the wee hours of the morning is a big benefit of hiring a doula earlier in your pregnancy. I have been hired as soon as the home pregnancy test shows a positive and as late as 41 weeks. I WANT AN EPIDURAL, DO I NEED A DOULA? Birth is not only a physical event; it is an emotional journey. So many questions and concerns being to ruminate in parent’s minds once they no longer have to focus on the physical task of coping with contractions. Your doula supports you through the months and weeks leading up to the birth and during your early weeks postpartum. This is your birth. My goal is to see that you have a fulfilling and happy birth experience, whatever that means to you. WHAT DOES MY PARTNER DO IF I HAVE A DOULA? A doula can never replace the love and support that your partner can provide. You are bound to experience a wide range of emotions at your birth. You may feel excited, anxious, or potentially fearful. Michelle will help you cope with all the fears and anxieties both of you may have. A doula is sympathetic, and informed. I can be a quiet calm presence offering both of you reassurance. Birth partners are generally more involved because the pressure of the unknown is removed and both of your needs are being met. The doula gives helpful suggestions about what comfort measures work best during different stages. Because this is an intimate experience between you and your partner your doula may stay in the background to allow privacy. In the event of a long or difficult labour the doula can give the one-on-one attention the mother needs, while the partner takes a break or rests. A doula will help both the mom and partner to relax, and help to ease their concerns therefore allowing them both to enjoy this remarkable experience. I believe that birth matters and support is not a luxury. 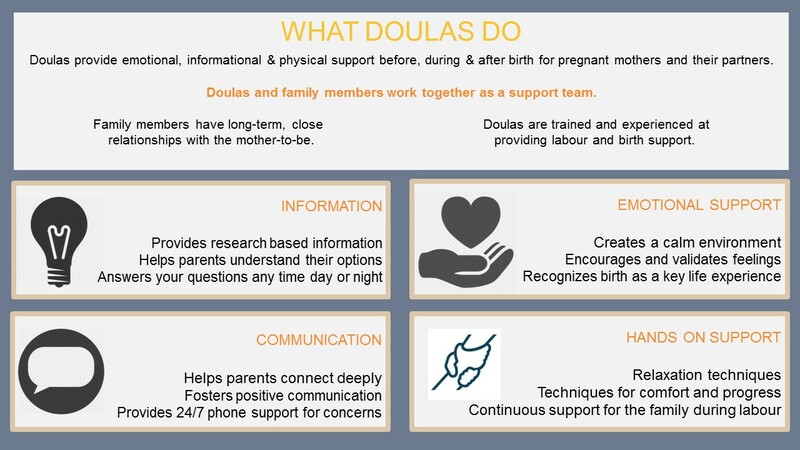 It is important to me that all people have access to doula support. I encourage you to get in touch with me regardless of your situation and together we will explore your circumstances. Having a thriving practice gives me the opportunity to provide care to many more people through a sliding scale, and pro bono work. You have the opportunity to watch your love, passion and confidence get reflected in the smile of your own little “birth beginning” for years to come. I look forward to helping you realize and embrace the wonderful connection between you, your child and your family, through a comfortable, informed birthing experience. Have a question or to set up your complimentary consultation to learn more about the incredible labour support you'll receive by choosing Birth Beginnings, contact Michelle.